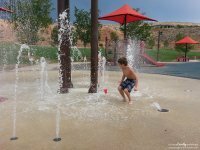 A very easy, very kid-friendly trail that will keep the family happy without expecting too much! 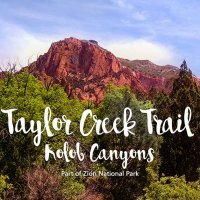 This trail is an easy 2.5 miles, located at the top of Airport Road in St. George, UT. The trail begins atop the locally known “black hill”, where the old airport use to be located. The “black hill” refers to the various black rock, or lava rock, found along the hillside. The trail is well maintained and very easy for all ages. Although you are walking alongside the hill’s edge, it is in fact quite gradual and safe for all ages. 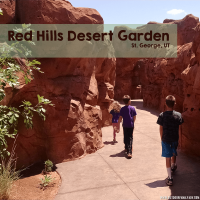 Even for me, a scardy-cat of heights+kids, did this trail without a second thought. At the beginning of the trail you will find a plaque. I suggest that the first time you visit this trail you take some time to read the plaques and understand the purpose of the trail and why it was formed. Even if you are not a mormon (member of The Church of Jesus Christ of Latter-Day Saints), it is still an impressive feat that these pioneers accomplished in moving massive boulders down the hillside and in to town. The trail does have some loose rocks with a small incline of wood-formed stairs. There is no shade on this trail, so it would be best to visit during cooler seasons or early morning/late evening hours. Even with the hike being as short and as easy as it is, I want to remind you to bring plenty of water. There are no drinking fountains on this hile. The views are amazing! As you begin the trail, you will have a gorge between you and where the old airport use to be. You will also have the view of south St. George ahead of you. Look for the golf course pond! Every so often there are a few benches you can use to take a rest on. Young kids and adults will not necessarily need the benches for a rest, however it is a nice spot to tie a shoe or pull out some water for the kids — even just taking in the view! The trail may not start out windy as you will find yourself on the backside of the hill. However, the trail does loop around the outside of the hill and as you crest the corner, the wind picks up a little bit. It isn’t anything crazy, but it is noticeable. Once you reach the actual “quarry”, there is a plaque placed on a large boulder. We missed it on our way in. I don’t feel like the “end” of the trail is very well marked, but my husband seems to think things have been moved around since he was last there, so I’m not sure if it previously had better markings that may have just been altered over the years. This plaque will be on your left-hand side as you reach the end of the trail. Take a moment to read more about this trail and learn about the pioneers that created it. They would come to this place to gather large rocks (about 10 feet long, 42 inches wide and almost 13 inches thick) with the use of dynamite and other means. Once they had the rocks needed, they would attach them beneath the wagons to bring them back down to the center of town. Quite impressive! Once at the end, there is A LOT of room for the kids to climb and keep themselves busy. Atop some of the black rock is a very old and weathered picnic bench. 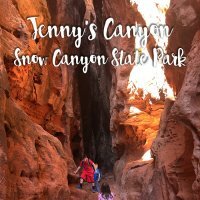 This would be a great hike to turn in to a picnic, even if you just find a few rocks to sit on, or bring a durable blanket to lay in the desert. Make sure to bring a trash bag with you to haul out any garbage. There are NO trash cans here and we want to keep the trail nice and clean for others. We saw a few rabbits, lizards and so many beautiful plants that are native to the desert. The views were AMAZING the day we went. It was warm and clear and the view went for miles. It’s fun to point out landmarks the kids are familiar with so they can get some insight as to where they are from that height. Look at this cool plant! It’s called a Creosote Bush. You can learn more about it here. The trail head is very easy to find. When heading north on St. George Blvd, turn left at Airport Road. Follow the road up the hill; once at the top, turn right immediately on 265 South, past the small playground. Take the next left on to Donlee Dr where you will see a small parking lot just south of some condos. The trailhead is well marked with an archway. This is also an easy trail to take a mountain bike on. I mentioned that the start of the trail had some stairs with a simple incline. Bikes can bypass these stairs by traveling up the hill from the parking lot. In the picture below you can see a worn trail off to the right, heading up the hill. Follow this to find a place to start with your bikes, allowing you to skip the stairs. 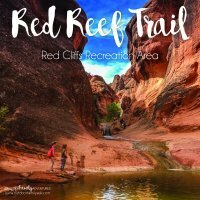 If you plan on taking this trail, it would be fun to read up on the history of the trail ahead of time so you can share some insight with your hiking buddies. 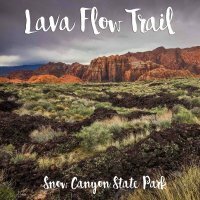 Since this trail is so easy, it allows for great conversation and sharing with the family and kids! To learn more about the LDS temple that this quarry was used for, CLICK HERE. Click here to see a short video of us on the trail (Facebook Live)!